Collecting hole or research hole? Where are the minority voices? It becomes evident pretty quickly that black and minority Hoosier voices are hard to hear within the collections at the Indiana State Library. Historically, the seminal works on Indiana’s history are heavy with the prominent voices of the day: legislators, lawyers and wealthy white men. The county histories published in the late 19th and early 20th centuries almost completely leave out people of color who were living in the towns in our counties. That’s not to say we don’t have a lot of neat resources where black lives rise from the pages; we do. For a sample see the black history research guide here. However, most of what we have was published more than 20 years ago. A search in our catalog for Julia Carson or Boniface Hardin retrieves zero results. We collect published printed material for the Indiana Collection. It’s not until historians seek out and publish about these lives and events that they intersect with the well-trodden histories in the collection. 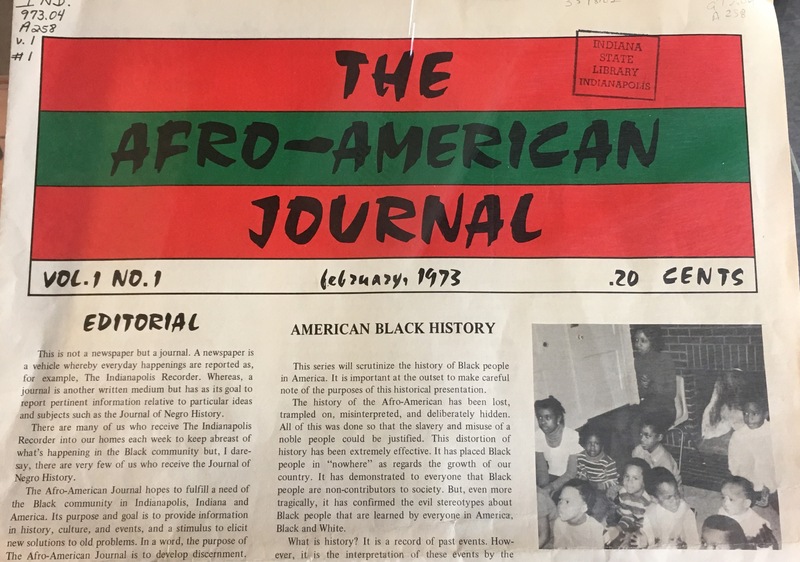 The Afro-American Journal was edited by Father Boniface Hardin and Sister Jane Schilling, both of whom were founders of the Martin Center and Martin University. The Journal gave voice to policy ideas and issues facing black Americans, as well as historical research on black communities and leaders. Hear Father Boniface Hardin in his own words discussing the aim of the Journal here. The Indiana State Library has scattered holdings from 1973-1976. I want to put a call out for donations or suggestions to enrich our print collections specifically capturing the voice of black Hoosiers and other minorities. I encourage you to contact me or comment here with title suggestions. Are you researching and writing articles? Self-publishing? I’d like to know. Does your organization have a publication that we lack in our holdings? Do you have a collection of photos, a diary, a collection of letters, recipe cards? These might make wonderful additions to our manuscripts collections. Don’t toss them or hide them in your attic; consider making a donation to the Indiana State Library. Learn more about donating manuscripts here. Once added to our collection these publications and documents will be processed, findable and researchable! It starts with you, then the librarians and archivists, then the historians, then the publishers and then comes the Netflix docuseries… oh, wait, I got ahead of myself.